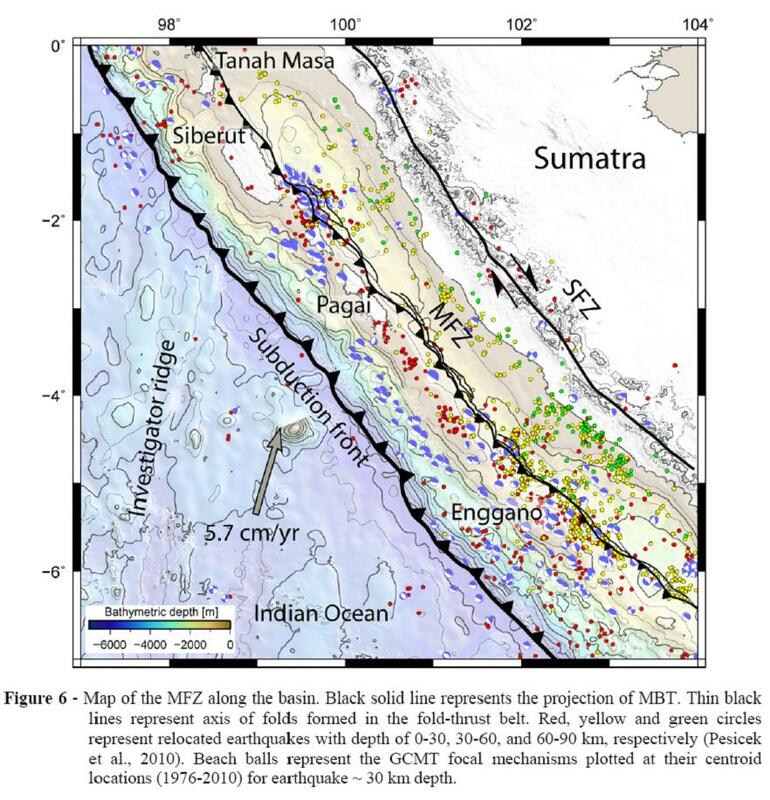 This article notes the structural features in the Mentawai forearc that can be interpreted as products of compression of the accretionary wedge and forearc basin sediments. Compressional phases since the Late Miocene initiated (a) the landward vergent foldthrust belt in the Mentawai Fault Zone (MFZ), (b) reactivation of seaward vergent imbricated thrusts in the retro-accretionary wedge, and (c) uplift of the accretionary wedge and some parts of the forearc basin. The authors interpret that the northwest part of the accretionary wedge underwent higher compression and tilting. The compression of the forearc is suggested to be controlled by the combination of the geometry and position of the continental backstop, and the subducting bathymetric high in the oceanic plate. Tagged accretion, accretionary wedge, backthrust, earthquake, fold-thrust, forearc, forearc basin, forearc high, forearc high thrusts, fracture zone, investigator fracture zone, ma'ruf mukti, Mentawai, seismic, sumatra, tectonics of indonesia, uplift.